When you think of Key West you probably don’t think of glass bottom boats. You may think, instead, of beautiful sunsets, a fun and lively environment, and Jimmy Buffet. Now, it’s all changed, with Wild Dolphin glass bottom boat. Wild Dolphin Boat purpose when it sets sail is explore the depths of the sea through the glass bottom hull, with great sightseeing, a relaxing atmosphere, and to ultimately find a pod of bottlenose dolphins. 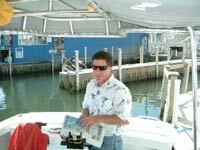 When I arrived at the dock where the Wild Dolphin Boat rests, I was warmly greeted by Captain Tim. Tim explained all the amenities on the boat; a cooler with beverages and snacks, all weather gear to keep dry, life vests, and the glass bottom hull in the middle. I was surprised to see a boat of this size with a glass bottom hull. I have seen much larger boats with them, but never a 6-passenger boat. This was very special and I was anxious to see how it was going to work. We waited patiently for all the passengers to arrive. Once settled there were two others, and a father and his 6-year-old son. Soon, we headed out from the marina for our 3-hour adventurous journey off Key West. Since the conditions were windy, Captain Tim gave us rain gear to combat the water chop spewing out of the harbor. As we gained speed, the water sprayed over the boat and got us wet. Thankfully, we had the rain gear to keep us dry. The powerful engine pushed us through the water to the side of the island where the dolphins are normally found. It was here that the wind slowed down slightly and we spotted another boat that had the dolphins in sight. The boaters of Key West are great at working together on dolphin spotting. It seems that the local outfitters communicate with each other, with the mutual goal of respecting the space of the bottlenose dolphins. This way it’s a win – win for everyone, dolphins and humans alike. Almost like the dolphins were on cue, they left the other boat and swam, excitedly, up to our boat. We all jumped up with our cameras. A word of advice, don’t take a digital camera like me; the shutter speed is too slow to catch the dolphins jumping and playing in the water. Most of my pictures were of tails and bodies beneath the water. I kept missing the dolphins as they posed on top of the water. 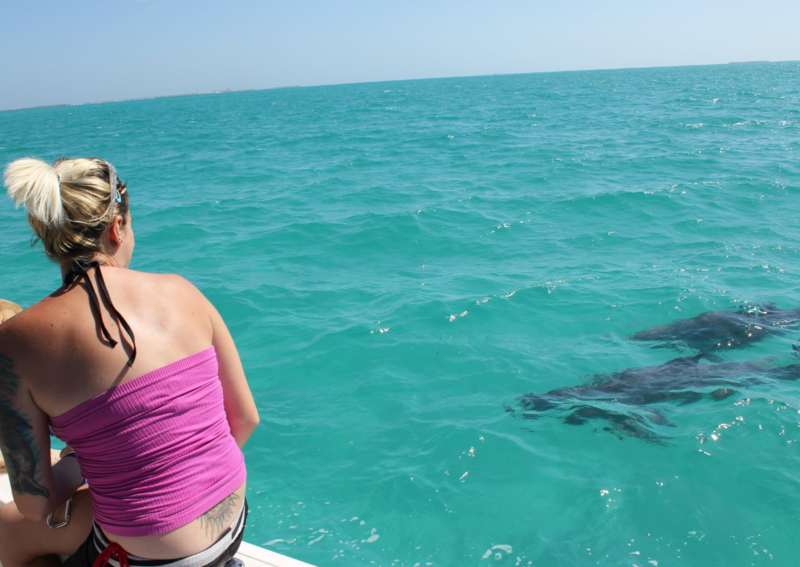 It would have been better to have a disposable camera because the dolphins were so close to the boat. The shutter speed is quick and the pictures are decent. We spent about 30 minutes with the Bottlenose dolphins. It was small pod of about 2 – 3 putting on the show for us. They seemed to enjoy our company. The day was perfect for viewing. It was sunny and cool on the water. Unfortunately, the water wasn’t very clear because of the wind. I reminded myself that I need to take the good with the bad when it comes to weather, since I can’t control what happens. There is one great thing about Key West. Since it’s an island, when the wind is blowing hard in one direction on one side of the island, the sea will be rough off shore, but on the other side of the island the seas will be flat and calm. After our viewing of the dolphins, we went on to explore Key West and to find a place to snorkel. Captain Tim did his best that day to find a clear and calm spot for us, and he did. He found a protected boat wreck off the island. We docked the boat and then proceeded to get on our snorkel gear. I jumped in first because I am an experienced snorkeler. I anxiously swam to the boat wreck. Captain Tim was right. The wreck had an abundance of fish. The fish were darting back and forth through out the boat. It was spooky, yet thrilling. The water was really clear around the boat, but, unfortunately, we were not able to use the glass bottom portion of the boat. 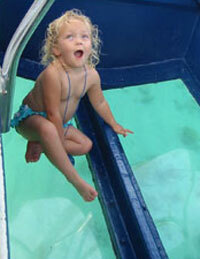 The glass bottom portion of the Wild Dolphin boat would be great for those that don’t want to get wet. 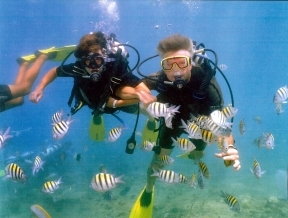 For me, the adventure is made by getting wet and partaking in the snorkeling. From what I understand, the Wild Dolphin Boat is the only Dolphin Encounter boat with a glass bottom hull. You may not always be able to view from it, but it’s a nice option if the ocean conditions are good. 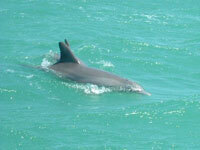 You might even get one of the dolphins to swim by the hull, thus viewing them from their home in the ocean. After snorkeling, we warmed ourselves on the boat with some snacks and beverages. We talked and got to know each other a little better. Then we headed out to have another chance to view the dolphins again. We found them even more playful than before, jumping and splashing in the water. We tried our best to get good photos. The father was snapping away while his son was squeaking with joy about the dolphins. The father had promised his son that he would see dolphins, and boy, oh boy, dolphins are what they got. Soon, our time was up and we headed back to the dock. the Wild Dolphin Boat dolphin encounter trip made for a great day. We all thanked Captain Tim for his gracious disposition and skilled boatmanship. At the dock we said goodbye. Waiting at the dock was the Sunset Dolphin Encounter group. 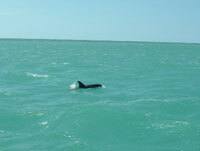 During the winter/spring there is a 3pm Sunset trip that includes dolphin and sunset viewing. The sunsets in Key West are incredible, and world famous. This, I think, would be a nice way to end the day, viewing the dolphins while holding your significant other and watching the glow of the sun retreat over the horizon. If you’re interested, the Sunset trip is very popular, so make sure to reserve your spot early. 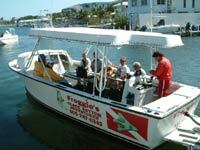 Times of the trips change during the season, so please contact the Wild Dolphin Boat for an accurate schedule. Finding Froggie’s boat is fairly easy. When coming into Key West on US 1 one of the first major intersections before heading into old town Key West is Palm Avenue. Once crossing over the bridge, you will see Harbor Light Restaurant and Marina. Take a left into the marina and you will see the 6-passenger boat waiting to take you on a voyage. Here you can eat under the stars and huge Banyan trees. The food is really good. You must try the pork tenderloin and their key lime pie – the best around. This is a reasonably priced fish house serving “fresh” seafood in a very rustic environment. All the food is served on picnic tables. The restaurant is filled with lively locals and tourists.